Open from 4-8.30 Mon-Thu; 2-9 Fri; 11-9 Sat; 12-6 Sun. 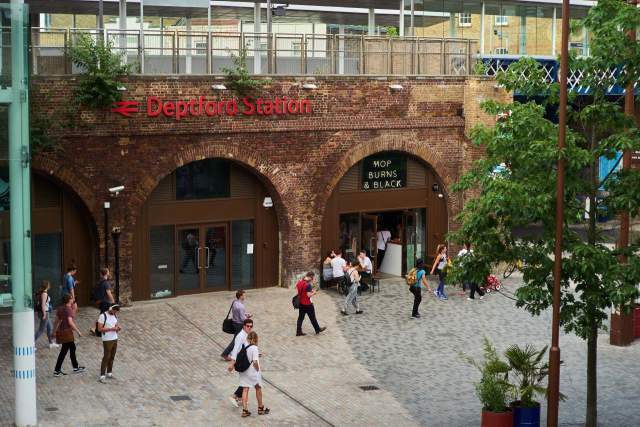 This is a great spot for HBB’s second location - in a railway arch underneath Deptford station, right in Deptford Market Yard – a collection of independent shops, bars and market traders, with a great vibe – and being situated between Gin & Beer/Villages Brewery and Taproom SE8, its crawl potential is huge. The shop is smaller than HBB Peckham, but they still manage to cram in around 350 bottles/cans, nearly all refrigerated, and there are two tables outside for on-site drinking. There is very limited scope for drinking inside the shop due to space restrictions, so bear that in mind in colder/wetter months. No growler fills for now but this might change, and in common with Peckham they only accept payments by card, and they also sell other nice things like hot sauce, natural wine, mead, cider & snacks.